Liverpool win against the Saints, but conceding first, pretty it ain’t. A youngster continues to wait for his chance, is the club leading them a merry dance? Klopp talks about the Munich seat, but Jürgen you still have work to do here you twit! The Good, The Bad and The Ugly, another week reviewed at the world’s favourite football club Liverpool F.C. Coming back from a goal down to beat Southampton 1-3. Liverpool continue their habit of making things difficult for themselves, and sending the fans home with more grey hair and less finger nails than they came with. True to form the Reds fell behind for the third time in the last four games. This time to a Shane Long effort after only nine minutes. To be fair to Southampton, it looked as if they might have be able to thwart Jürgen Klopp’s men. Naby Keita equalised with a header 10 minutes before the break but Ralph Hasenhuttl’s men stood firm long into the second half. 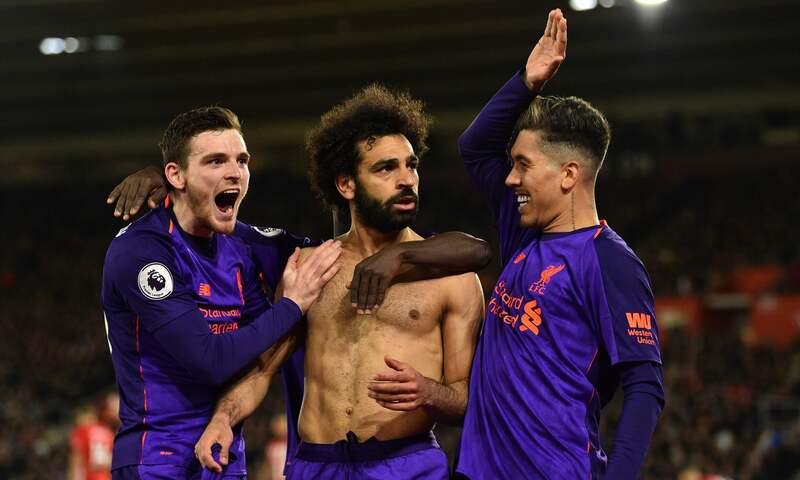 It wasn’t until the 81st minute that Mo Salah scored his 50th goal for Liverpool to give the visitors the lead. Jordan Henderson’s tap in after running the length of the pitch on 86 minutes put the game beyond doubt. The captains celebration was one of relief, ecstasy and a battle cry, all rolled into one matching the elation of the fans. Hendo changed this game when he came on. A real captains performance when we needed it! The form of young Harry Wilson not being rewarded with a first team chance. The 22 year-old has scored again at the weekend whilst on loan for Derby County as covered by the LFC official site. 14 goals don’t lie. That’s more than Divock Origi has scored since he has started playing for Liverpool I’d say – without even looking at the stats. I’m that confident. There are times when Liverpool are crying out for another striking option and I struggle to see what Klopp’s obsession is with the Belgian. Daniel Sturridge is constantly left on the sidelines. Rhian Brewster, despite the fact that he’s been injured, I couldn’t see getting a chance if he was fit. If there is even a semi-Bad injury to Salah or Sadio Mané, the team are screwed. If the team fails to win the league this season they’d only have themselves to blame. Seven draws will be the deciding factor. Right now there appears to be talk of yet another loan spell for Wilson next season. Why? And how much will the club pay for another striker if they shop in the summer? The 51 year-old ruled out the possibility of managing the Bundesliga leaders when recently asked. But on reflection, I don’t believe Klopp’s statement is the real issue here. One has to ask why this was even published by Talksport. In my opinion this is simply another example of biased reporting which is intended to court controversy. The popular press’ wish to Liverpool fail goes on. My question to the writer would be: of what relevance is this? And why is it thought to be so newsworthy now? It’s just another example of the press wanting to cause a disturbance among Liverpool fans in order to create instability. Who could Pep Guardiola be managing next? Perhaps this question could have been considered. Or is this only something relevant for Liverpool? If this article was written on traditional paper, I think it’d be used toilet paper by now, let alone fish and chip paper as per the old adage.